(Join us as we kick off import week) You knew that imports had turned a BIG corner back in 1972 when my motorhead friend Ronnie traded his 1968 Buick Skylark GS350 for a spanking new Datsun 240Z. A furrin’ car? With an inline six under the hood? Horrors! But Ronnie was on to something — one of the most affordable and fun-to-drive cars available in America. 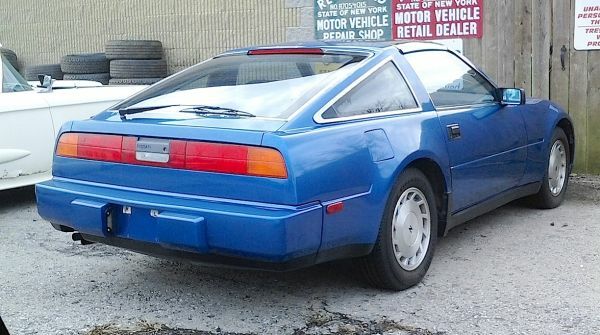 This 1987 Nissan 300ZX is from the third generation of the popular Japanese two-seater, which had dropped the Datsun moniker and was now sporting a 3.0L V-6 under its long hood. By now the Z, in true American tradition, was longer, wider, and more expensive than the original. Better looking? You be the judge. Saw this one over the winter in Youngstown. Jim Corbran, RRofWNY The post RealRides Of WNY appeared first on Buffalo Cars.